Each year we take a day to have a great time together, thoughtfully plan for the next year, and celebrate our accomplishments. 1. Day before fill out two sheets which are full of questions designed to make you think. 2. Day of go do something fun together , then plan for next year. 3. Later that evening celebrate with our families. Let’s start with the two sheets we use to prep for staff day. Sheet one is about your individual life and for your eyes only. It's a time for you to reflect on what's going on in your personal life and how behind you are at getting anywhere mentally/physically/spiritually/romantically.... Usually I end up crumpling this one and then smoothing it out and then taking deep breaths and then staring out the window for a while. Sheet two is about working here. Same sort of reflection but all business, it's about how can we serve our customers better, how we can work more efficiently, what things worked, what projects we want to start etc. The sheet is laid out in that classic "SMART" form you know Specific...Measurable...Actionable... bla bla. Every company I've worked for has tried to force goal setting in this form with futile results so it's nice here that we mostly just use it as scratch paper for our ideas. With this thinking time finished we met on retreat day and hopped in Sean's EV for an ice-cold ride to our destination. Sean had the heat off to keep all our senses really sharp and because using the heater decreased the the range we could travel. At times we breathed too much which fogged up the interior and so he rolled the windows down to make it even colder but defog stuff. I tried to breath as little as possible to maintain some warmth in the car. First first order of business was some coffee. Americano for me, chai for Sean - childs temp, something mocha sprinkles for Amy, shots espresso for Brenda, and she brought her own mug. They gave me an extra paper cup under mine to cancel out Brenda's environmental attempt. We traveled into Canada for some team building. THIS YEAR WE WENT GO-KART RIDING OH BOY!!! Well I guess we were really good kids because Sean-Santa took us Go Karting! I had my heart set on wearing a sweet racing jumpsuit which were available but the attendee warned me away from it by subtly saying she's seen the laundry room and would never wear one herself. fine. Went down to the track and started our engines. It was so early there were just the four of us which made it pretty good. Sean set the tone of the first race by bumping me on a corner (although he claims I did this first). After that the gloves were off. The cars were so fast and the track was so wiggly that it was hard to avoid smashing the others on corners because I wanted to win so much. Everyone was sore the next day/hour. Next we went to a cafe to eat and plan. Sean wanted to charge the car so we could make it home so he dropped us off so he could charge it and walk "a block or two" back. After waiting 45 minutes for him we started googling things and found that the charging station was at a Nissan dealership 3 kilometers away across an interstate. Here in USA we’re not as good with the metric system but I know that kilometers are closer to miles then to blocks. It was pouring rain so when he finally returned he was soaked but as always in good spirits. We ate some lunch and did some great planning together. I appreciated how collaborative the process was and how everyone was involved and heard. What resulted was a list of goals separated by quarter which we will work to implement. Later that evening we met for dinner with everyone's respective partners at Bellingham Cider Company and enjoyed bowling afterwards. That's how a Haven staff day goes. Pretty good. We're looking forward to this next year and all that it has in store. Best wishes to all for 2019! I don’t even know where this desk concept started. The idea existed before I started here more then a year ago. Like many designs the execution resembled a game of telephone where the result only loosely resembled the original idea. I think Sean started the concept, then it went to Amy, then they dropped it on me to organize the build. The completed desk! Come by and see it! Check out the journey below. The design called for rustic reclaimed beams which formed the front facade. Luckily Sean knows a source who has supplied reclaimed wood for other projects (such as our beautiful stair treads). Csaba @ Northwest Reclaimed (instagram). Sean and I went out to to woodlot and it was a total dream. So much incredible wood with character to look through. We could have spent hours but we have families to return to so we had to feign some level of urgency. 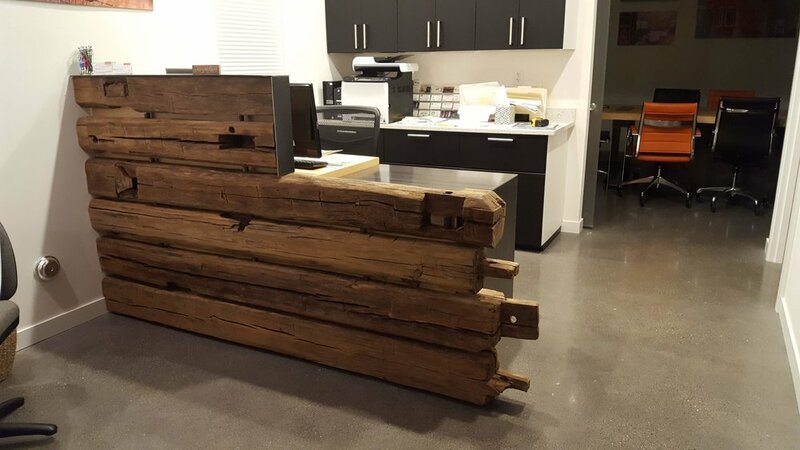 We selected some beams from an old barn which had hand hewn marks and old mortise and tenons. Csaba was kind enough to prep and rip and trim them for us. Without his tools and expertise it would have been very time consuming and challenging. There’s no substitute for a bandsaw mill when you need one. Behold the awesome power of the wood mizer. I want to have a reason to have one of these. I took them and sanded and stained and worked them to get them to a completed state. They needed somewhere to off-gas and chill while we worked on the rest of the project. I left them in my barn on my old tractor. They seemed so at home there. The beams needed somewhere to rest in purgatory waiting for their next life in Haven’s office. My barn with the tractor for company seemed fitting given their history. We were hung up for a while looking for someone to build the cabinet portion, it’s hard to find someone willing to do a weird size one-off single cabinet. After searching a bit we were glad that Nick at Blue Ridge Building was willing to work with us on our project. We ended up having some of the other major components made by him as well. The bonus for me was getting to go by his shop and nerding out over all his nice equipment. I appreciated how communicative and helpful he was throughout the process. The cabinet and major pieces were made by Nick @ Blue Ridge Building. Excellent craftsmanship Nick! All this captioned stuff made by Nick. I wish I had snapped a picture before we put all the stuff on it. Fridays I have kids so we went to the hardware store to get fasteners and spacers and glue etc. I gave them tape measures to try to keep everyone’s hands to themselves. Sean looks so safe! The beams need only a a little trimming. But somehow it took so long! Was it my measuring or his cutting? Is it just an example of why we work so well together? We took two separate work sessions to assemble this. One Sunday Sean and I got together to do the main beams/cabinet assembly. There was a lot of measure twice cut thrice and then measure a couple more times with a couple more cuts. Remember when your mom cut your bangs and just kept leveling things back and forth while your bangs got shorter and shorter? Did this only happen to me? At any rate we were trying to get the beams to sit perfectly on the front facade. Luckily we had plenty of beam length to work with so the only casualty was time. The official Haven shop. We do all our best work here. When you pay to put in the sidewalk you can do whatever you want. To my delight we once again were required to do some creative cutting and thinking as battery power began to run low. Quote from Sean “Fine carpenters would not like us doing this right now”. I think we could apply that quote to almost every part of this build. Except for Nick’s work that he did alone. And Csaba’s chainsaw and milling work that I helped with by watching. A precision cut without a tablesaw. Sean “carpenters would not like us doing this”. 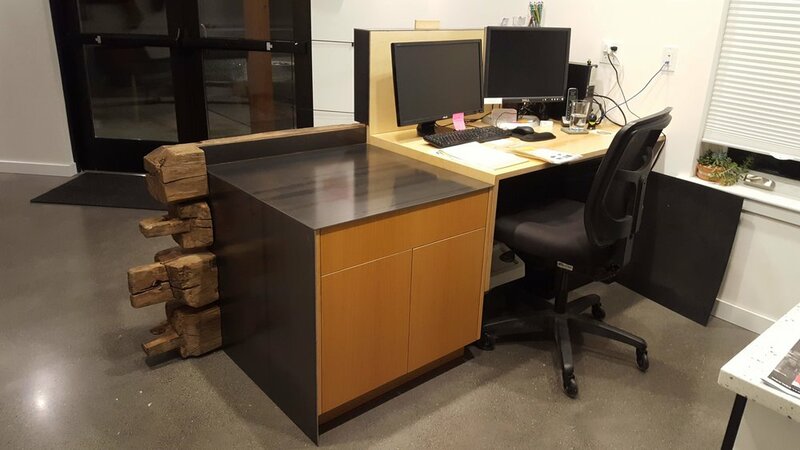 The waterfall ADA height counter and top trim is 3/16 natural cold rolled steel from Carlson Steel. I emailed them the required sizes for the pieces and they made it easy, same day pick up, cut to size within tolerance. Since natural steel is poised waiting to rust at the slightest touch, we quickly applied a couple polyurethane coats as soon as possible. Not saying it won’t eventually get some more wear and character from use, but this will help. Setting up the steel with contact cement. ugh. The smell inside was sickening. Fans and windows and everything was open. We took another evening to glue and fasten the steel. It was surprisingly time consuming. Also the contact cement was toxic and left little room for error. Once you press it together you’re done. Hopefully it was where you wanted it. We had all the fans going but still I couldn’t escape the strong smell and feeling that we were losing brain cells. We had one last wood piece to glue at the end of the night and found some tube adhesive. Looks like our brains were still sharp, look at this great hammer-handle caulking gun! Somehow we don’t have a caulking gun at the office? How can anyone take us seriously if we don’t have one in our office toolbox? At any rate this hammer works great except the glue comes out wrong.. So beautiful! We added a couple coats of polyurethane to the steel so everyone didn’t leave little rust fingerprints everywhere. The rustic beams bring such a history into our modern space. I’m working on making a torsion box type surface in my home shop right now. It is an interesting intellectual challenge. 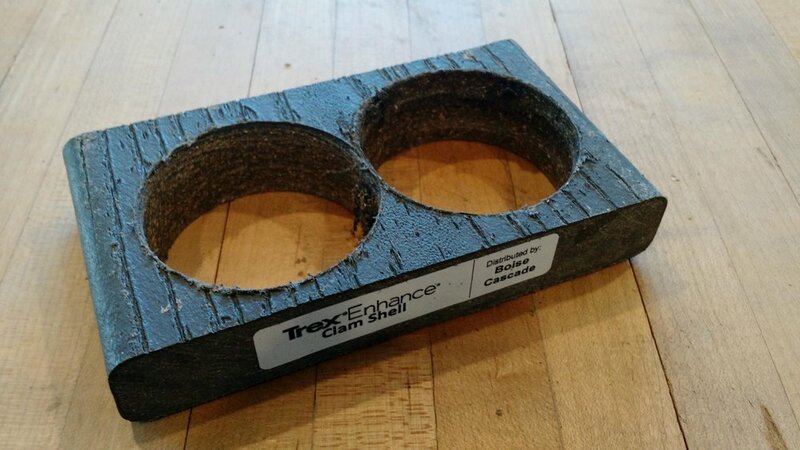 It’s not hard to build a surface that’s physically strong. What’s tricky is building a surface which is as close to flat as possible. Ideally I would use a reference surface to base mine from. But I don’t have anything flat enough. I have a slab floor but I don't trust it to be flat enough. What is flat? Water. <---frozen? calm? very hard to practically use. mmm want want want. But do I need this? I'm going with the cheapest option, the level/straight edge approach, but I have to be meticulous if I want a good result. The plan is to temporarily fix one side of the table as I'm building it to the wall of the shop, then level it as perfectly as I can, then build and shim the other three sides of the table top relative to the first one using the level. But do I have a good enough level? There are new digital ones now, do I need it? I started looking at the tolerance on the models available. Since I’m trying to stay in the sub $100 price point, the digital levels have an accuracy of 0.1 deg. Placed at the center of my 9’ span that’s 0.094" at each corner (about a tenth of an inch). That’s perfect usage, so my actual result will be worse. But guess what? Bubble levels (called “spirit” or “vial” levels) actually have better accuracy then the fancy digital ones. And you can pick one up for $10-15. Per Johnson Level their accuracy is .029 deg. I put that into Sketchup and I find my perfect usage would result in .027” (about 3 hundreths of an inch). Bubble level is 3X more accurate. But that accuracy is subject to the skill of the individual reading the bubble. Isn’t that interesting? Careful use of a bubble vial level will result in a more accurate result then the fancy new digital level! And they are way cheaper/you already have one. Look, I know there’s merit to the idea that the digital one is easier to use, and the bubble one leaves one with a bit of uncertainty as to if the bubble is perfectly centered. So the higher precision of the bubble coupled with the lower ease of use, vs the lower precision of the digital level paired with its friendlier use means that the net practical result might be the same. But the bubble level costs ⅓ to 1/10 of the digital. Don’t throw away that bubble level. It’s more precise than you thought. You can get a fancy digital one if you like but it’s not more precise unless you pay for a high end model ($100+). Few users have a legitimate need for the accuracy obtained by higher end levels, but in our tech age it's hard to resist the siren call of the digital level. As an evolved homosapien, the goal is always to do the heavy lifting with your brain. “Work smarter, not harder” is the familiar adage. At our office the need for manual labor is relatively light, so this applies mostly to the areas where we spend the bulk of our time - on the computer. Clicking. There’s so much clicking. Clickity click click clickclickclick. Each of those clicks is a decision, each decision a tiny infinitesimal finger fluctuation. The other day I learned that former Haven-DW nerd Stephen had taken the time to program the mouse to achieve a double click with one click. And that’s most amazing thing I’ve ever heard. This resonates so deeply with nerd culture that I’m afraid I risk alienating most of our readership with this concept leaving the effective audience to mostly myself and members of Haven, who will likely give this a cursory read. I’m going to dive into this anyways because I just cannot help myself. The act of double-clicking is just about as old as modern computing. It signifies a decision. It takes two actions to communicate the decision to the computer. One finger twitch, then less then 500 milliseconds later, another. If you’re too slow, no decision is communicated. All modern computer users are so used to this convention that achieving a double-click isn’t particularly difficult. But it does take more effort then a single click. So much of what we do in Sketchup requires a double-click, that it can get somewhat onerous. Here’s where the fancy mouse kicks in. Your typical mouse only has two or three buttons. But we use these fancy mousies which allow all the buttons to be programmable to different actions. So we have one of the buttons execute a double click action. BOOM SINGLE CLICK = DOUBLE CLICK. And it gets worse. Sometimes we need to triple-click. You can single click a regular click and then click the double click click and it will equal a triple click click click! You can go crazy if you want and program the mouse to repeat clicking every 500ms as long as you hold the button down and that gains you essentially the ability to “infinite-click” with a single click. You can just sit there holding down the button while the mouse is just working so so hard clicking the heck out of itself until you are done achieving stuff and then you can get up and take a break having worked so smart and not hard. A screenshot of my settings. Obviously I use "jump" and "grenade" pretty often. I mean, if productive work were as simple as just clicking. But that’s the point. The work we do is mostly mental. We need to spend our energy making decisions with our brains and the computer should more or less execute those decisions with minimal effort. By streamlining the work we do, reducing clicks or whatever, we spend more of our time thinking about the design and less time thinking about how to make the software obey. Are you ready to go get a new mouse and double your productivity? Did you come to our open house? It was HavenDW's 10th anniversary and also our new office ribbon cutting. Here's a fun recap if you missed it. For those who attended, I put some behind the scenes commentary too. Amy! hurry it up, can't you see there's a big line down the stairs? Also, Ben Mann artwork! Party Prep: Two weeks before, Sean was making it rain at every event he attended with invitation flyers. Brenda and I were forcing them on WYPS kids and Amy maybe handed some out at GAC? Point is we tried to get the word out. The flyer was also attached to every outgoing email ensuring that for two weeks everyone we write with started running out of data in their inbox. I know this will come as a shock, but there was a bit of prep work to do to make the place perfect. There's a facade that everyone does for a party. Pretend that your place is always spotless and stylish and having everyone over wasn't that much work because life is just so easy for the beautiful. Obviously, there's a lot of work that goes on in the background to make that story plausible, even for the pros at HavenDW. It was several days of cleaning plus the preceding weeks on and off of projects to get the place up to Sean's high standard. It's hard to know what to do when your photo is being taken. Obviously these guys made the right call. One of the best moments for me came a half hour before the party was scheduled to start. We were all prowling the space, decorating redecorating each other's decorations. That's the challenge of having four people who are passionate about design, everyone sees the world slightly different and everyone wants the place to look its best, thus it was a forever redecorating loop. My own personal passive-aggressive style was to attempt to hide items which I considered unstylish. I wanted minimalism so I was quietly trying to hide all tchotchke. But I guess others were looking for clutter to make the place homey and so no progress was really made to either pursuit. Doors opened people came! We were so excited to see the community response. It was great to have everyone in our space chatting it up and looking so good. A big thank you to everyone who attended. Halfway through the night we all went outside in the rain and did the ribbon cutting thing, MR Mayor and Sean sharing the big kid scissors for the fancy moment. Thanks to everyone who said some nice things at that toasty moment. It was all very wonderful but the wind and rain were working hard and this encouraged everyone back inside for more food and prizes? I think we were trying to do a regular door prize drawing but at some point it dissolved/we forgot about it. There might be some prizes which are retroactively awarded to some unsuspecting attendees. 8:00 party was mostly done. A couple of people hung out late until they realized they might get looped into cleaning up and made an escape. High fives all around good job HavenDW staff! Can we do this every month please? 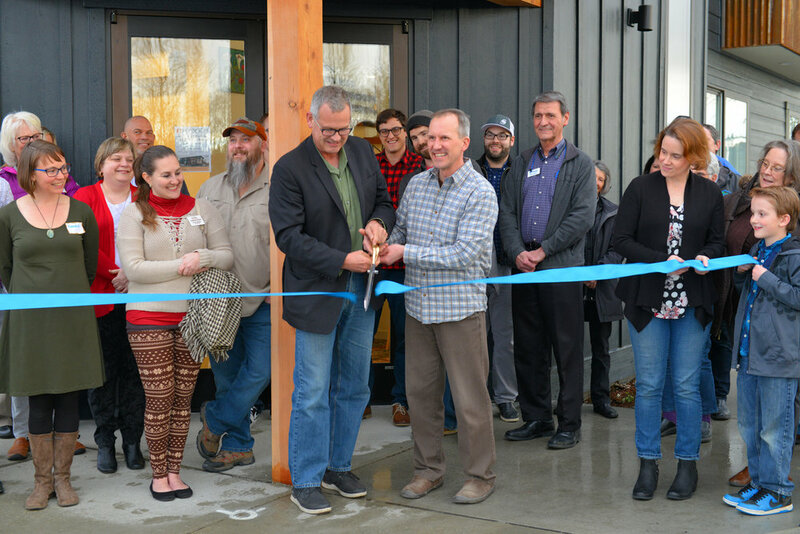 Thanks to all who helped us celebrate and for supporting our new location on 5828 2nd. We're looking forward to seeing you again soon. Good night Haven! Thanks for a great party. A big thank you to Rebecca & Judd Greenwood for taking these photos. Hi, I'm Isaac, Haven's newest member. It's Sunday and I'm alone in the office, which is great time to take some pictures of our digs and introduce myself. About me: I've been a 3D modeling enthusiast since 1995 when I got started using Truespace and drafting with Turbocad. I spent a lot of time using animation software such as 3DS Max and Bryce before going to Western Washington University and studying art and communication. Fast forward- I worked as a graphic artist for School Specialty, then drafter and eventually design engineer for Zodiac Aerospace, designing airline furniture. I've always been a big fan of architecture so when I saw an opportunity to join Haven I wanted in! Enough bla bla I have images of the inside to show off! I was trying to take one of those cool "pretend I'm working" images like the rest of the team has on the bio's page. Walking in the door. Usually Amy could greet you but it's Sunday so no. That's it! Thanks for checking out our office and letting me say hi. If you want the real tour, come on by. We always love guests and we'll be having an open house in March to give you an official reason to visit if dropping by random isn't your thing. Haven is officially in the new office! Tenants have moved in their spaces as well and have been patient while improvements continue around the site. Landscaping and fence building was done last weekend by the team. Glass has arrived to finish interior railings and take place of the OSB that has served it's purpose to achieve temporary occupancy. Other improvements will continue as we settle, but it feels great to be in the new space. Look for details on an open house to come in the Spring. Check out the progress photos of the project with the link below and be sure to come say hello at our new space. Haven's new office space is coming along! The exterior is taking shape. Now interior work can be focused on and we're still on target for our fall move in date. Guests mingling upstairs in the open floor plan. 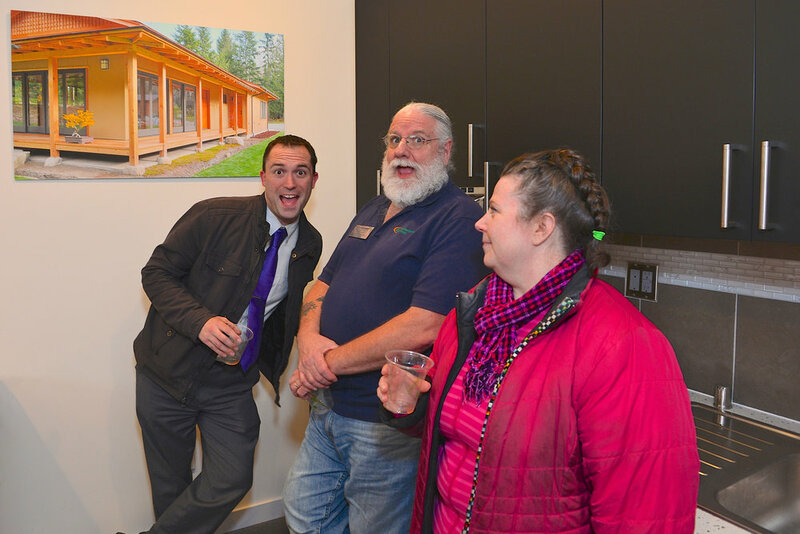 Check out clips from our recent open house. No matter the size of the project, an appropriate budget should be the first thing you establish, for all projects you can do this yourself. During this preliminary stage, through careful research you can establish an initial project budget, then once the project design gets moving along you can contact a local contractor for more a more accurate budget. Can your project be accomplished? While your project may sound like an amazing idea, that doesn't mean it's feasible, like commercial ventures in the middle of a residential neighborhood. Although it sounds great to be able to walk two doors down to the grocery store, in an established residential neighborhood, it is highly unlikely it would ever be permitted by your jurisdiction! Do your research first, or hire a professional to do it for you. Spending a little time and/or money now could save you from going down the wrong path in your investment. Step Three: Contractor or DIY? You may not have a choice about which route you take, but either route you need to know exactly what you're signing yourself up for. From financing, to permitting, to ground breaking and beyond, it may all be your job. 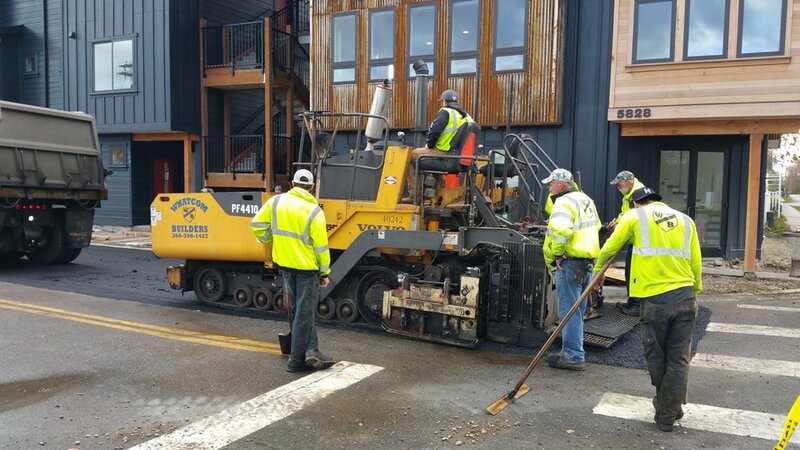 No matter what though, you need to be clear on who's responsible for what, because soon your contractor will be on your speed dial and talking to them will likely become a daily routine. Be sure to interview several contractors, getting along with all parties involved will help to ensure the success of your project. Depending on the scope of the project and your own abilities, you could execute this yourself. However, depending on the complexity of the project you may want to consider interviewing and hiring a design professional. This nominal cost should result in a better design and help avoid extra costs as your project is being built. Keep in mind, there are many types of projects that by law require the stamp of a professional thus ensuring the safety and welfare of the occupants. This may not even apply to your project, but it does apply to most. This step is integral and should be started as soon as possible. Depending on your jurisdiction, and the complexity of your project, this process could take just a matter of days, to months, to quite possibly even years, the whole time costing you time and money. Doing a thorough Feasiblility Study should inform you of the task you have ahead of you at your planning and development departments. Now, this might not be a very big deal for some, as they are now set to build their backyard chicken coup, but for many others, this is the project they've dreamed of for years and now they're finally going to watch (or literally make) it take shape. This can quite literally be the most exhilarating, and exhausting, months, or even years, of your life. Although this is a momentous occasion and worthy of celebration, you should be sure to take the time to mentally prepare yourself for the task ahead as it will likely test you. Many people come out of it ready to start their next big project, like both Sean and I, however, just as many come out with more grey hair, or less hair(! ), and a tremendous sigh of relief and thanks that it's finally done and they'll never have to go through it again! Whatever the outcome of your emotional state, in the end, you will be overjoyed that it is all over and done with, and, if you took the proper steps, it will have been a successful and far more enjoyable process. Keep in mind why there even is the saying, "On time and under budget," and why it's regarded as such a good statement to be able to make! After all these steps have been taken, or taken into consideration, I hope you are able to enjoy your chicken coop, remodel, new house, or maybe even your new grocery store, or at least the profits from your well thought out venture for years and years to come, I know I will! A rendering of the new home to come from the street. Being one of the older neighborhoods in Bellingham, South Hill residences have seen a lot of remodels over the years. 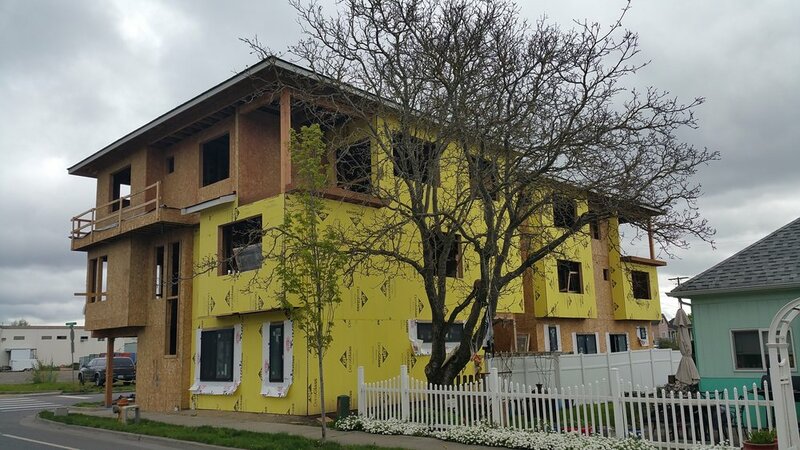 A 1-1/2 story craftsman style home is about to go through a major transformation. The current residence is being taken apart piece by piece to make way for a 2-1/2 story modern home. The residence will have a similar footprint and take advantage of the views there are to offer. Stay tuned for more new to follow as this haven is getting built! Making way for the new. An old craftsman residence is being disassembled on site to recycle and salvage materials. Buildings are generally comprised of straight lines and measurable distances to discrete points. In the design of buildings, we generally do not get to work with curving shapes very often because of this. For a recent small project, we were asked to create a landscaping plan which contained a large amount of curving geometry. This was a bit of a learning process but the final result will give the owners a very organic backyard space where they can enjoy their beautiful gardens and tall trees. A lot of progress has been made to Sean & Jaimi's Traditional Net Zero Haven since our last post a couple of months ago. The roof is on, windows are in, insulation is in, drywall is up, the rain screen is nearly complete. And more importantly, the solar panels are up! The 33 panel system will create an average of 25kWh every day. With electric appliances and heat, it's not clear how much the energy the Hegstad family will use annually. But with rebates currently available, the Hegstad's will receive an annual check from PSE based on the kWh their panels produced. Solar panel technology has come a long way in the past few years. Previously, it was only recommended to install solar panels exposed to the south and propped at an angle equal to your latitude. For us here in the Northwest, that means 45 degrees (or a 12:12 roof pitch), which is steep. On the Hegstad Residence there are three locations of solar panels: one catching the suns energy from the east, one from the south, and one from the west. And they're not at a very steep slope either. 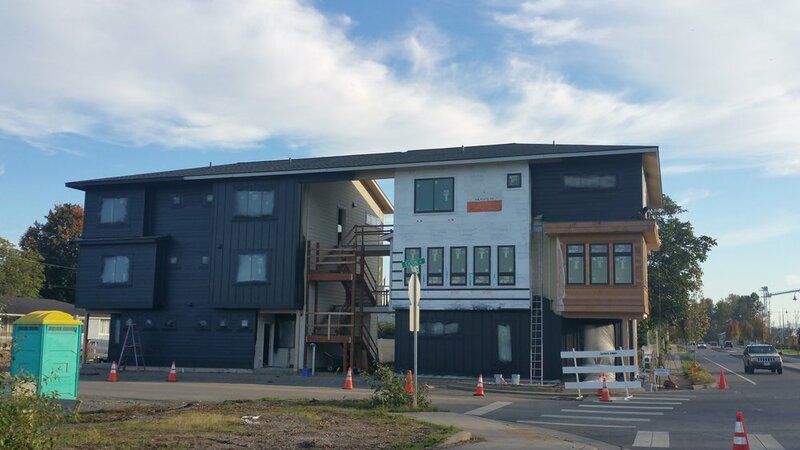 The next steps are to install the exterior siding and all of the interior trim, cabinets, fixtures and appliances. 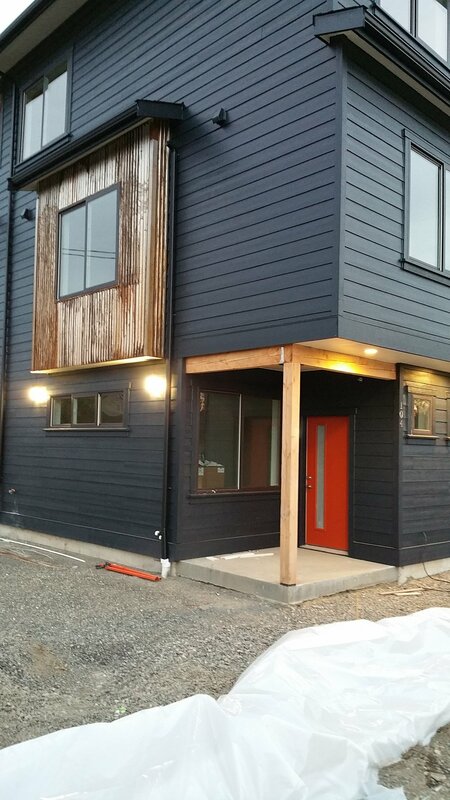 The exterior color scheme has been narrowed down to two options, but I'll leave the surprise for next time. The south side of the residence with patios in place. Standing in the living room, looking towards the dining room and kitchen. With interior walls close to being done, interior trim work, flooring and cabinets will be installed. Haven switched to using SketchUp and Layout for both the design development (DD) and construction document (CD) phase back in 2008, after lack of enthusiasm with 2D drawing programs. The programs are intuitive to use and backed with friendly customer service, and they allow us to accurately model the entire project. 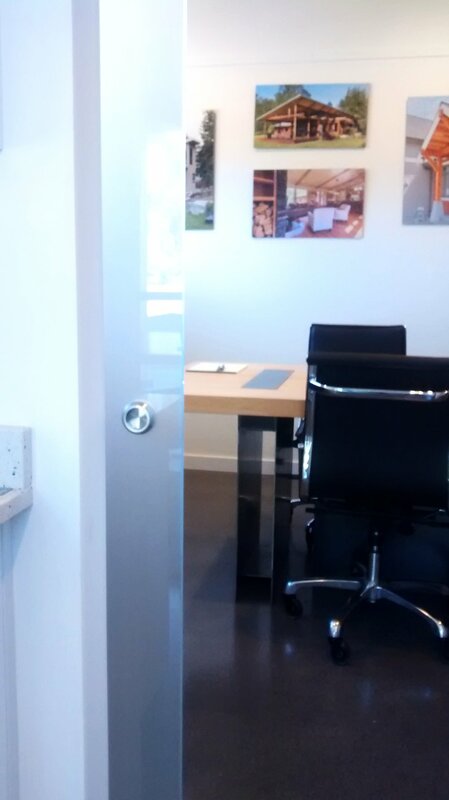 This helps to convey the experience of the space to the client before construction is even begun. We’ve realized the benefit of using SketchUp for a long time. 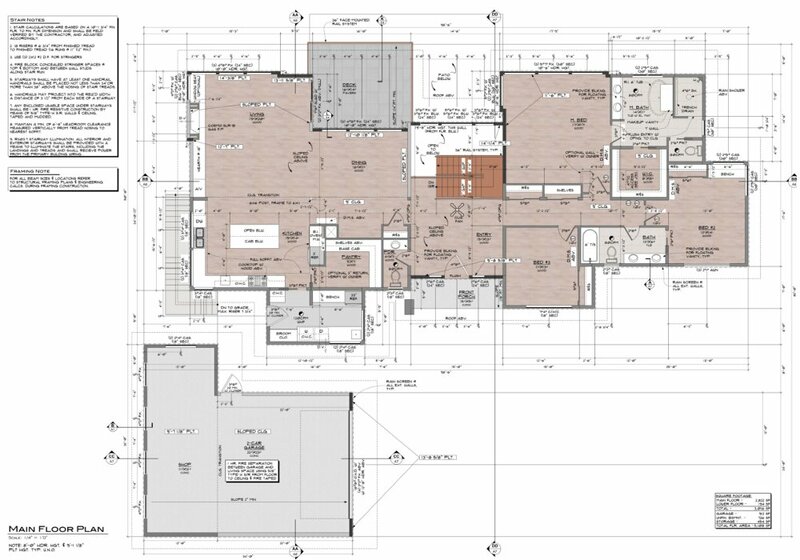 What we didn’t realize until attending SketchUp Basecamp this year was how few people are using Layout to create their drawing sets, especially construction documents. SketchUp is an easy to use 3D modeling program that is widely used by a variety of disciplines. Layout was made to create drawing sets from this 3D model. By setting up scenes in the model and importing this into Layout, you can even create an intricate set of drawings like construction documents. 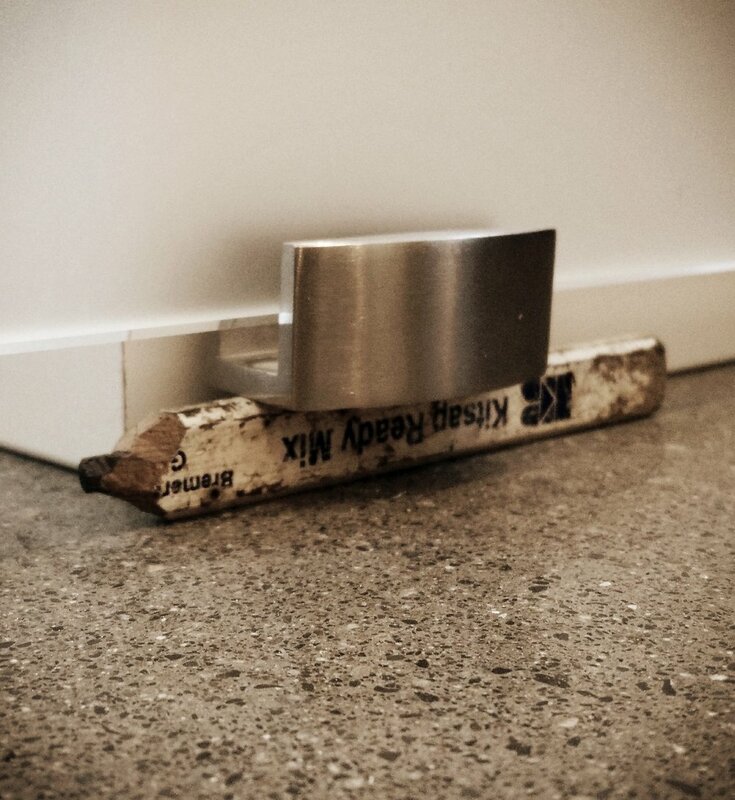 This keeps the drawings accurate and allows opportunity to visually portray the feeling of the space while containing technical information as well for contractors to build from. Below is an example of the difference of using Layout. The first two images were drawn with Layout and the second two images are from a 2D program that we previously used. While both are beautiful in their own right, using Layout certainly helps add depth to the drawings. Everyone has different abilities of being able to visualize a space from looking at a flat 2D drawing. By using a variety of 2D and 3D scenes, we're able to convey the character of the space. The floor plan of a custom residence that contains a lot of technical information, but also begins to convey a sense of the space. 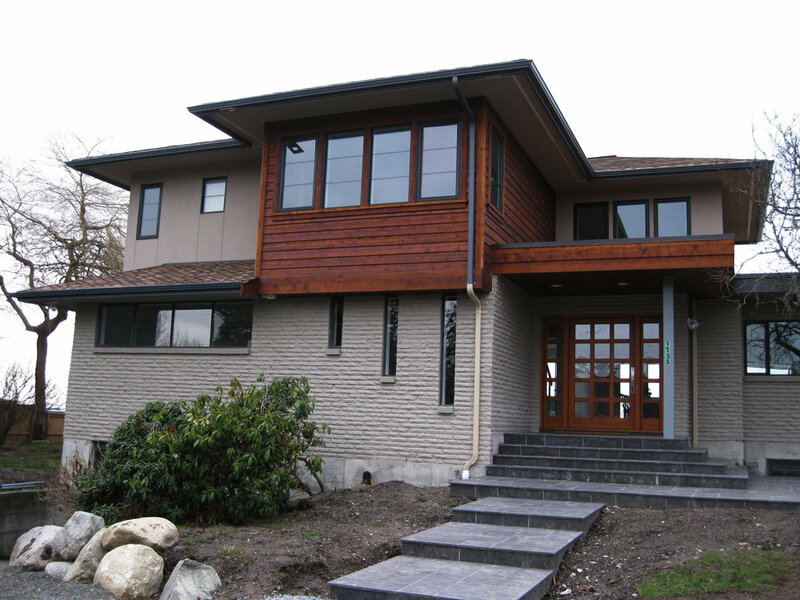 A couple of sections through the same custom residence as above. By layering scenes on top of one another, Haven is able provide sections to scale while also giving depth to the space. The floor plan of the 'Aldergrove Residence' drawn in a 2D program. 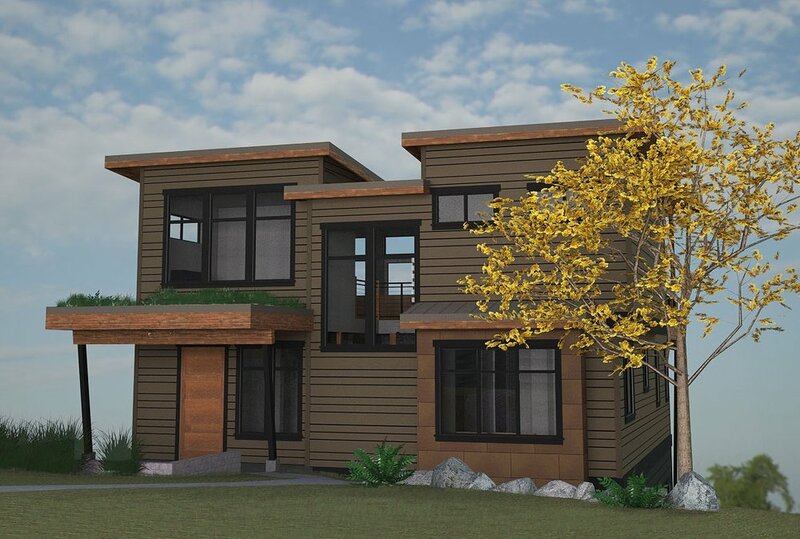 The elevations of the 'Aldergrove Residence' drawn in a 2D program. The fun is about to begin with the first keynote speaker and over 600 people in attendance. Stephen and I both have had the opportunity to attend the SketchUp Basecamp 2016 held in Steamboat Springs, Colorado. While we use SketchUp and Layout everyday for our projects, we are always looking for new ways to expedite our workflow, and be inspired by what is possible with these awesome programs. We have seen so many awesome presentations in two days and have already been given new ideas to improve our process, and better convey that information to both our clients and contractors. We've had a lot of fun and have really enjoyed what the Steamboat Springs area has to offer. Last night we got to take a gondola ride up to the Thunderhead Lodge to connect with other SketchUpers, and enjoy a fantastic meal while taking in the breathtaking views below. SketchUp pictionary was pretty fun too! Some good laughs watching teams compete in SketchUp Pictionary: "Is it Saturn? Flying rocks?... A duck?" "No, it was a bush." We have two days left to enjoy the beautiful Colorado scenery and continue to have our minds be blown with the possibilities of SketchUp. We're looking forward to bringing all of this enthusiasm and knowledge back to Haven! Sean's personal residence is coming along very quickly now! In these latest photos you can see all the walls are up, the rain screen is nearly finished, and the roof is on! There has been much progress as well since these photos were taken just over a week ago which has now gotten the home to the lock up stage! They are on target to have the home finished up and move in ready by the beginning of this next school year! It has been so great watching the progression of this innovative, yet still traditional home! Hegstad Residence, front and south side of the home. 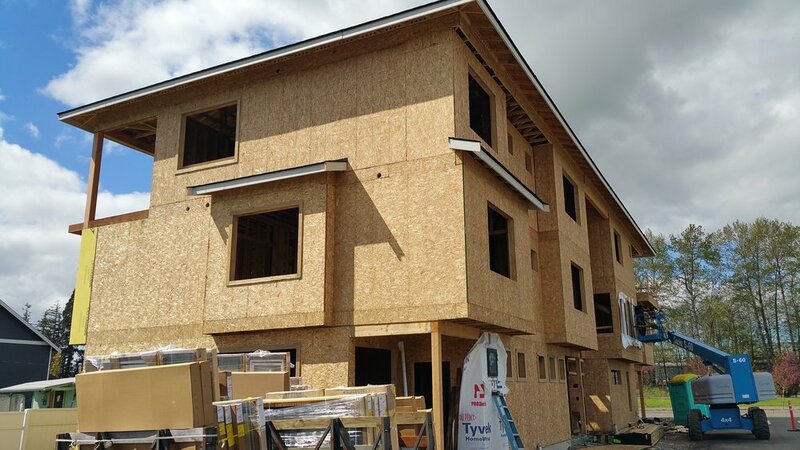 With the Zip System sheathing this new Net Zero home is both literally and figuratively GREEN! Upstairs common space/play area with views to the south of the trail that leads to the 2 1/2 acre park that sits just behind the home! Upstairs loft space for the kids. It's rather cozy at only about 4 1/2' at its' peak, but approx. 12' deep, so a perfect size for a couple of kids to sit and read books and have sleep overs!